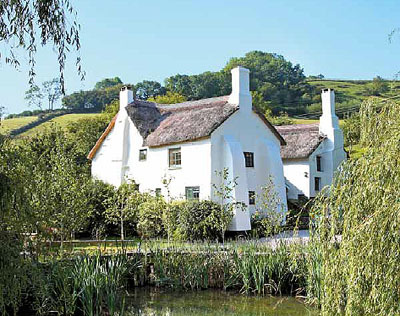 Coombe farmhouse is a Grade II Listed classic Devon longhouse with origins in the 16th century. The property is of cob construction under a thatch roof and has been very recently refurbished. The house has a drawing room, sitting room, dining room, kitchen, study/bedroom six, five bedrooms (one en-suite), family bathroom, shower room and laundry room. Coombe also retains much of its period details with large inglenook fireplaces with wood burning stoves in the sitting room and drawing room with also has a bread oven and a cream oven. Outside are wonderful landscaped gardens. To the front of the house is a paved patio and barbecue area sheltered by a bank of wildflower beds. The gardens are mainly laid to lawn with flowerbeds designed to attract wildflowers and other insects. Above the house and main garden is an orchard with mature plum, pear and apple trees and adjoining this is a large decked area with a gazebo perfect for outdoor entertaining. There are also two small paddocks and a small copse. All of this is in around four acres. The property is in a very secluded position with far reaching views over Dartmoor and the Haldon hills to the north east. The nearby villages of Higher and Lower Ashton provide everyday amenities and more extensive facilities can be found in Chudleigh just four miles south. It’s also just eight miles from Exeter from where the train to London Paddington departs. The guide price is £675,000. For further information please contact Strutt and Parker on 01392 215631 or visit www.struttandparker.co.uk.